Are Interactive Maps in our Future? Home » Are Interactive Maps in our Future? We thought buyers might also be interested in similar information, but reaching them in addition to targeted sellers in that area can be dicey. You can’t just mail to a certain area as the buyer could come from anywhere. We thought “What if we could target both worlds, the buyer and the seller?” One way to target buyers is to reach them on the Internet for specific search items. For instance, let’s say a buyer is looking to buy in Reflection Lakes. If we could somehow provide this list of data when buyers are searching, would buyers find that helpful? We don’t know, but our hunch says they might. We’ve researched a way to provide a map of an area which shows all the homes available for sale, all closed sales within a certain time frame, and all pending sales and pinpointed them on the map. Additionally, if you click on the pin, you get additional information on the home, like list price, sold price, size, age, pool, waterfront description, bedrooms, bathrooms, and much more. You can customize it to display about anything you want. We even went so far as to provide links to additional information if available, virtual tours and more. In this way, a buyer or seller can quickly see a homes location on a map and compare it with other like kind homes for sale. It is color coded and sorted by status, so you can look at the solds to get an idea of what homes are selling for or just actives. Perhaps you’re riding down the street and just want to know what it’s on the market for. The map is set for a particular point in time, however it can be updated at any time. The agent selects the fields to display. The consumer can zoom in or out, as well as click on street view to look up and down the street and view the homes photos, or even take a satellite view to get an idea of the terrain and the surroundings of the community. We can setup a map like this for any area and import data from the MLS. If you live in a community you think would benefit from something like this, give us a call at 239-489-4042 or send me an email Brett@topagent.com and I’ll look into it. If you think it’s missing something, or have feedback, we’d like to hear it. We honestly don’t know if the public will use it or like it. We do know it’s cool and useful to us, and we enjoy trying new things if they have the potential to help in the buying or selling process. 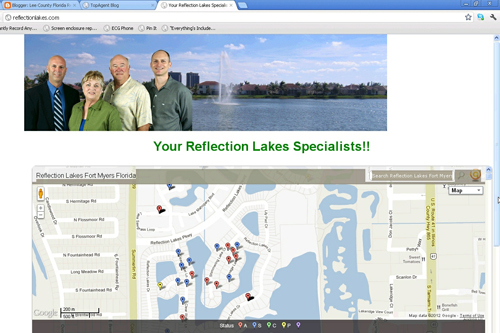 Posted in Reflection Lakes, Southwest Florida Real Estate.Tagged Lee County Florida, Reflection Lakes.